When I was planning my canyons driving trip I identified 4 or 5 key locations, such as Grand Canyon, Bryce, Zion, where I was planning to spend the majority of the time. But specifics of the trip was that I would have to drive on average 400-450km every day from one key location to another. It concerned me a bit since perspective of spending 5 hours every day in long and boring transitions was not very attractive. Now after completing the drive and processing most of the photos, I have to admit that I was absolutely wrong. The transitional drives were the most exciting part of the trip at least from travel photography perspective. Just imagine that in 5-6 hours you can photograph 3 or 4 different canyons, a couple of mountain ranges and few beautiful valleys. The landscape would change every half hour and it is always different and never boring. 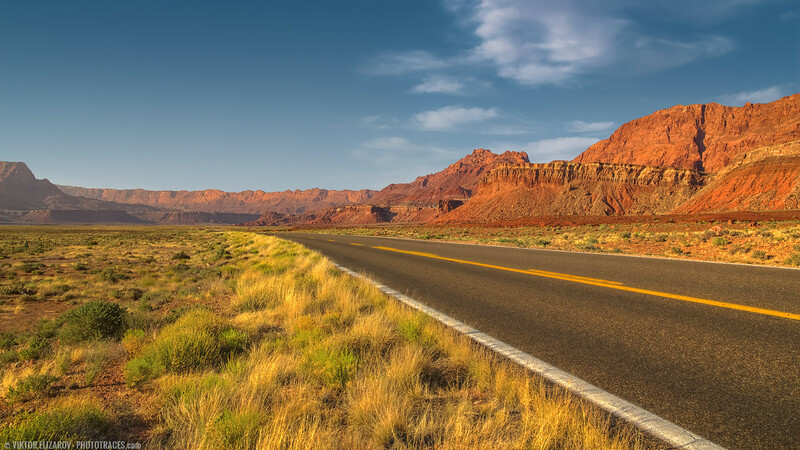 The featured photo is from my first long drive of the trip from Grand Canyon National Park to the city of Kanab in Utah. The road runs through the unnamed valley along Echo Cliffs just a few miles before Navajo Bridge crossing. At the point, I started to run out of space on my memory cards and I had to switch from taking 5 or 7 bracketed shots to only 3. But it was enough to be able to process photo as HDR.